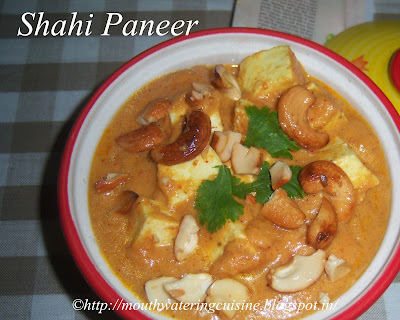 Shahi paneer -- Paneer lovers make a beeline for this dish. A very mild and tasty side dish for roti and rice also. When I have the habit of buying paneer from stores, the pack contains one recipe. If it is interested I will try to make it. 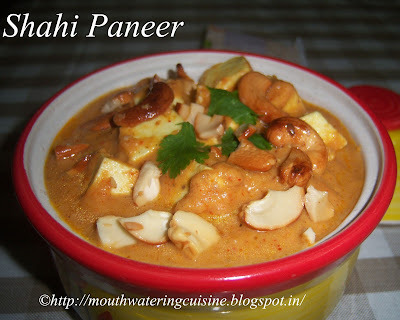 Shahi paneer is one such kind of recipe. Whenever I prepare this curry kids love it very much. Once I started making paneer at home, one batch of paneer cubes are meant to make this curry. Some times I use entire paneer for this dish only. As the name says paneer is the main ingredient. Paneer is cooked in a gravy made with grinding tomato, onion, green chilli, ginger and garlic. Shahi is the term for royal, so the curry is made with royal ingredients like cashew nuts, raisins. Cut paneer into cubes. Heat oil and fry paneer cubes till they turn light brown color. Of course this is optional, as I did not fry them. Make smooth paste of tomatoes, onions, green chillies and garlic. To give rich flavour add cashew nuts to it and make a smooth paste. Heat ghee in a kadai, fry cashew nuts and raisins. Keep it aside. Again heat ghee in the same kadai, add the above paste and fry till the raw smell goes off. Or fry it till ghee separates. Add slat, turmeric powder, garam masala and white pepper powder. Let the gravy boil for two minutes. Add milk and let it boil for two minutes. Lastly add paneer cubes and let it boil for five minutes. Once the gravy thickens, add fresh cream and cook for two minutes. Garnish with coriander leaves, leftover cashew nuts and raisins. Serve shahi paneer with roti or chapati.